An intricate story with complex, diverse–if not a bit confusing–characters. The best part is that history is woven into the narrative, a piece of history that was unfamiliar to me. The writing is wonderful, rich and creative. Many times I simply paused in awe of the author’s ability to describe a scene or individual. My only complaint is that the characters remain underdeveloped. I finished the story feeling as if even the protagonist was holding something back from me. He remained mysterious. Certainly, all the supporting characters seems that way. Overall, a very enjoyable read. Who sat on your last nerve yesterday? What relative, family friend, crazy-Christmas shopper or road hog nearly sent you over the edge? It’s easy to quickly lose our cool with those who frustrate us. It’s especially draining when we’re talking about ongoing discord. These relationships and situations are likely to come into painful proximity over the holidays. I’m not sure why, but God recently gave me a perspective check. In the heat of the moment, our reactions to these people is fiery. It’s us against them; you against us; I’m right and you’re wrong. But regardless of who is “right” in any given circumstance, one of the best ways to defuse an argument and lower your blood pressure is to remember that the other person isn’t evil, they aren’t your true enemy and chances are they have good intentions. I’m going to go out on a limb here and suggest that most of us don’t know anyone like this. At the very least, your spouse probably isn’t evil. Neither is your mother-in-law, sister or best friend’s boyfriend. So, if they have good intentions as you do, if they are not really an evil person, maybe you can just let this one go? It’s tempting when plans get cancelled and I’m home alone with the baby to feel like I have no life, but as I was thinking that just yesterday – God brought to mind: I have more life in my hands right now than I ever have before. I am literally holding a life, a physical life, that he has given me. This is the highest priority, the highest honor, and the highest responsibility I have ever had and will ever have. I am honored to write for Proverbs31woman.org. I hope you enjoy this post! But this morning I recognized myself in an anecdote Lysa TerKeurst shared on Focus on the Family. She had been invited to share the crux of her new book, Uninvited. (Pun intended.) And I decided that if I saw myself in her story, I might find some deeper meaning, some richer lesson by writing about it and, hopefully, you might find yourself there too. Lysa was attending a banquet for leaders. Dozens of tables were spread for numerous guests of high calling–to lead, teach and mentor others. She looked forward to hobnobbing with them, sharing stories, gleaning ideas and mingling with others of the same ilk. The facility had gone all out, there were name cards for every seat. For a while, she milled about uncomfortably looking for her name. It had to be there! Finally, she found it on a table in the very back of the room but to her disappointment, she didn’t recognize a single other name at her table. No matter, she’d meet new people. But no one showed up. There she sat by herself at a lovely, decorated table set for 10, in a room full of influential people–alone. Guess What? 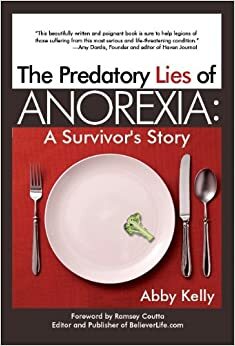 My first book, “The Predatory Lies of Anorexia: A Survivor’s Story” is now out in audible format! It’s available as such on Amazon, Audible.com and iTunes. I’m giving away a few free copies of the audio version through Audible.com. Want a chance to listen to my book? Comment here and share this post on Facebook for a chance to win! I’ll announce the winner on Sunday!